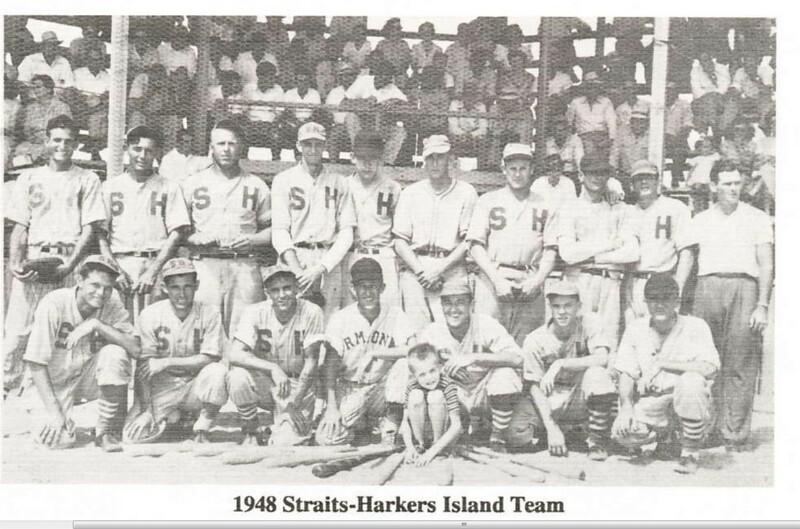 My cousin, Creston Gaskill, called “Sno’Ball” by almost everyone, loved to tell a story of a memorable game of baseball played between Harkers Island and it’s sister community of Salter Path. I call Salter Path a “sister” to Harkers Island because like the Island, it was settled mostly by families who migrated from Shackleford Banks after the great Hurricane of 1899. Even as late as the mid-point of the last century the two villages shared not just their history and family surnames, but also a taste for stewed loon, a knack for catching jumping-mullets, and an absolute hysteria for the game of baseball. Given their mutual love for the sport, it was little wonder that ball games played between the two were always a family squabble, and sometimes, to borrow a phrase from Ty Cobb, “something like a war.” This was never more so than on a late summer afternoon, sometime in the late 40’s when the two teams met on the sandy field of Salter Path. The game was tight until the very end, and came down literally to the very last pitch — even if it wasn’t a pitch. As related by Sno’Ball, who was catching for the Island team, the Islanders held a one run lead going into the last half of the ninth inning. But even after giving up two outs, the home squad was able to load the bases and put the tying run within just ninety feet of home plate. The Salter Path batter then worked the count full so that everything, yes “everything,” would came down to one last throw to the plate. By this time, the sun had begun to set behind the sprawling oak trees that bordered the first base line of the ball park, and the late summer shadows had already extended onto the field and beyond the pitchers mound and home plate. Realizing that the game, and the pride of both communities hung in the balance, Moe Willis, the pitcher, called his catcher out to the mound for a conference. Moe was young and strong, and was one of the best pitchers ever to play for the Island team, but by that time he was spent, and realized his best stuff might not be enough to close the matter out in the way his family and friends hoped and expected. No one is sure exactly how or when he came up with the idea, but when the catcher joined him to discuss what the last pitch might be, the pitcher suggested that they just “fake it” and go on home! Pandemonium immediately broke out on the field and especially in the bleachers and among the crowds who had lined up three deep all the way down both foul lines. It was all the Island team could do to get to their cars without being trampled, but in short order they had made their escape and were headed to Atlantic Beach. This was where they planned to gather and celebrate before heading home to tell their story to the pitiful few who had not been able to see the game in person. But as the gathering commenced, it soon became obvious that their group was one player short. Sno’Ball it seemed had been caught up in the tumult at home plate and was unable to extricate himself in time to get with the rest of his team as they hurried to their departure. It was not until almost an hour after the others reached their rendezvous spot at Atlantic Beach that their catcher, and their hero, came straggling in looking even more spent than when the game was being played.